in my browser, it takes me to the glassfish v3 admin screen so it's not a bad port number. My guess is this has to do with the default install of glassfish having an expired SSL cert, but I can't be sure as I get no other information than this. The server log of glassfish doesn't acknowledge that I'm trying to reach it. Does anyone know what's causing this or how I can get more info to debug the problem? Also, keep in mind that if I change the remote connection settings to use port 55504, it still says the exact same error (mentioning port 7048 and everything). 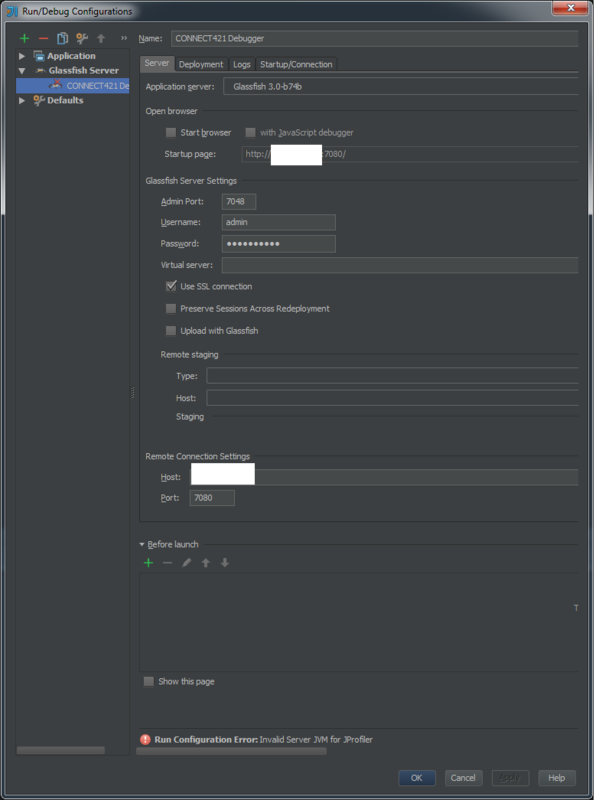 As specified in the closing note to http://youtrack.jetbrains.com/issue/IDEA-70519, SSL connection is supported in IDEA to GF 3.1+, secure connection to 3.0 requires completely different approach in the administration code and had not been implemented. I made a search at the days of IDEA-70519, but still have no idea how to setup remote GF 3.0 to accept non secure connections -- both 3.1 and 3.0 support non-secure connections from localhost only. If someone knows, please share here or in that youtrack.